In between periods of working on the Wicken Fen project, over the last year or so I made a group of small works called Thorn. The making was spread out over the whole year with long gaps between stages and the thinking and process were quite different. I was interested in making a group of pieces within a limited set of parameters: size, format and colour palette. In some ways this was quite a formal exercise in composition. The emphasis was on balancing the colour and texture contrast between the plain and printed sections to develop a group of pieces that work both individually and together. Thematically, the group is related to the Blackthorn series. At the time I was working on this group, I was listening to Dowland and reading Peter Davidson “The Last of the Light”, while on my morning walks I was noticing the effect of frost, raindrops and mist on the hedgerows. I’m drawn to the way these phenomena both highlight and obscure the underlying forms. There are 11 pieces in the group, which can now be seen in new exhibitions at Gallery 57 in Arundel and at Bircham Gallery in Holt. Bircham Gallery is also showing work from the Wicken Fen series. Exhibition details below. If you can't get to the galleries, work can be viewed on their web sites via the links. Bircham Gallery: Spring Mixed Exhibition. 19 May – 13 June 2018. This weekend is the last chance to see Reflections & Revelations, my exhibition with Sally Tyrie at Babylon Gallery in Ely. Sally and I will be there from 2pm on Sunday afternoon (22nd April) and will be taking it down at 4pm. Hidden, our installations in the hides at Wicken Fen continues until 25th April. The exhibition includes a group of four pieces, Apparitions, which are the largest pieces I have made. One of the meanings of the word apparition is “an instance of something appearing; the act of becoming visible”. Perfect for these pieces that explore the theme of reflections and the interplay between true, distorted and false images. 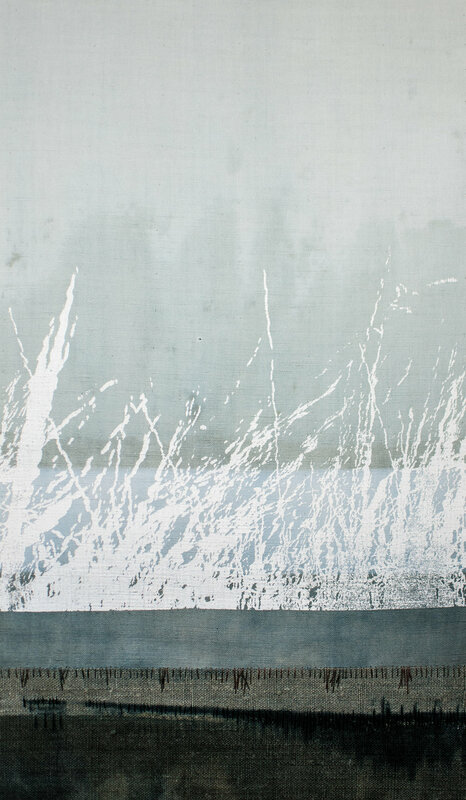 From a technical point of view, the work relies mainly upon screen-printing techniques, on old linen cloth that was printed both from the back and the front. A number of smaller works “Perception” explore the same ideas on a smaller scale. The exhibition also includes a number of monochromatic works. This is the first time I have worked solely in black and white on cloth, though I often do in my sketchbooks. In fact this series derived directly from sketchbook collages I made early on in the project that explored the lines and marks of the reeds as they were reflected in the water on the fen. From a technical perspective, these rely upon relatively simple screen-printed imagery but incorporate transparent materials, such as lens tissue and organdy, which allowed me to reverse and overlay images. The third group of work in the exhibition, Shadow Lines, bridges the other two. 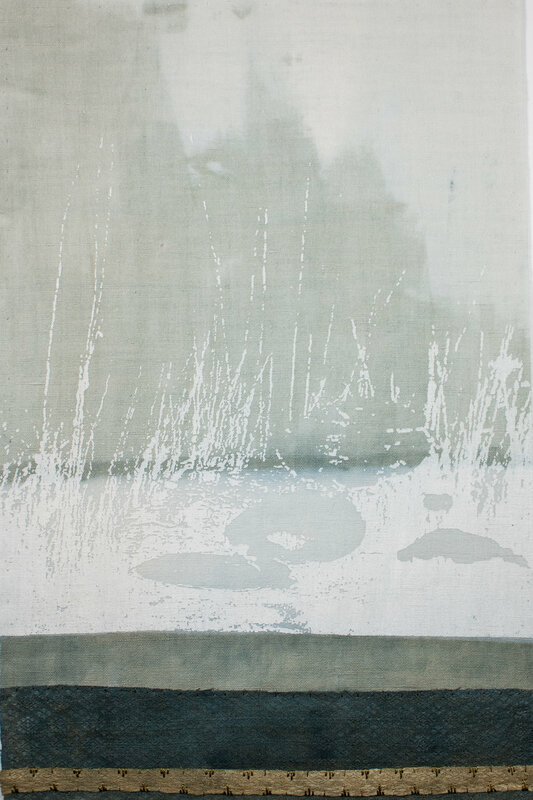 In this series, in contrast to Apparitions, where the reed imagery was encouraged to distort and alter in the process of printing, the reed imagery is printed in solid white, making the “reflections” into something solid, while the surroundings are allowed to dissolve and bleed around it. Colour and contrasts in texture were important in this group. The title alludes to the Joseph Conrad novel in which the “shadow line” is the invisible boundary between youth and maturity (I'm massively over-simplifying), though in this case it refers to the boundary between actual and perceived impressions. Working on both sides of the cloth and transparency has been important in this project, both for the ideas it involves about the surface and from a technical point of view, and something I will continue to explore. Our catalogue for the exhibition describes in more detail some of the ideas behind our work and their sources in the Fen. Copies will continue to be available from me or Sally after the end of the exhibition ... at least until we run out! Email one of us if you want a copy. The Crafts Study Centre in Farnham is currently showing an exhibition of textile art by Diana Harrison. I have seen individual pieces in the past – at Cloth & Memory in Saltaire in 2013; at the V&A’s Quilts exhibition (2010) – but this was a wonderful opportunity to see a comprehensive body of Harrison’s work, together with samples and reference material. So often, all you see of an artist’s work is the completed, final piece on a gallery wall – the resolution of the process. You don’t see the things that inspired them or the trials and experiments they worked through on the way to that piece. Nor do you often get to see several pieces of work that cover a sufficient period of time to allow you to see how one piece has grown out of another or the themes that recur from one to the next. I often think that this leads to a distorted view where all the focus is on the final product rather than the process that led to it or its wider context. And so far my own experience has been that that is not an effective way to work. All my best ideas have come out of the process of exploring and experimenting without necessarily knowing where it would lead. In Harrison’s case, it is particularly valuable to see a more complete picture because what came through for me was how her work is underpinned by a deep and thorough engagement with her materials and techniques and a consistent interest in edges, structures, folds, worn surfaces and transitions. A long, low shelf displays collections of objects and samples – material references – worn, flattened, packaging with marks collecting in the folds and creases; creased or folded papers; small samples and trial pieces that provide a rich context for the finished work on display. Harrison’s work creates an impression of strength, simplicity and quiet sophistication. This is achieved through a complex layering of repetitive and sometimes intricate mark making and surface treatment using dye, print, discharge and stitch. In several pieces, the cloth is pierced or burnt away so that only a framework of stitches holds the piece together. This is fascinating to examine close to, but when you stand back, the focus shifts to composition: simple forms, subtle tonal progressions and contrasts between light and dark. I love the interplay between simplicity and complexity in this. Line (2011) was my favourite piece. Six long, narrow panels (12cm x 640cm in total) that reference separate decades of life. Each panel was different and could have stood on its own; but there were delicious transitions from one to the next. Trying to photograph all six panels together, the image read on my camera screen as a single line. I even tried to see if I could persuade myself to read the actual piece as a single, continuous mark, like a stroke of charcoal drawn lightly across a rough surface, but could not quite - there were definite breaks and changes in the rhythm and texture that resisted this. Which of course mirrors how many of us actually experience different decades of our lives. Pillowcases (x6), a new piece of work, was another favourite. Six ordinary pillowcases that had been deconstructed and alternately dyed, printed and stitched. The fascination was in the way the cloth had been folded over and back on itself, exploiting the contrasts of dark and light to make different forms and shapes. I loved the way the folds interrupted the flatness of the cloth and the juxtapositions of different tones and textures. The V&A produced this video of Diana Harrison talking about the inspiration for her piece, Box, in 2010. Diana Harrison: Working in Cloth is on until 8 October 2016. Diana is giving a lecture on 5 October and there is an excellent and comprehensive catalogue, available from the Crafts Study Centre. All the work shown in this post is by Diana Harrison, please give credit accordingly if you copy or share these images. I am grateful to her and to the Crafts Study Centre for permission to take photos. London was bathed in sunshine yesterday and I spent a fine, if tiring, day visiting galleries, bookshops and sitting in cafés. Pérez cuts and layers clays with different properties, such as white porcelain and black earthenware. Some of these clays expand during firing, allowing the object to swell in the kiln. Layers peel apart. Surfaces crack. Forms twist and tear. The resulting forms are reminiscent of obscure archaeological objects – twisted, eroded and encrusted until only a sense of the original form remains. The layers were like book pages or layers of cloth in the process of coming apart from having been coiled and wrapped around each other. Pérez says that with years of experience he can often predict what will happen but that invariably it is still a surprise with every firing … and it is this element of the unexpected that inspires him. Unexpectedly, this was a theme for the day. Earlier I had been to a discussion between Helen Carnac, who works with metal and enamel, and bookbinder, Tracey Rowledge, at Contemporary Applied Arts on the theme of how they manage, harness and embody “mistakes” in their work. In summary, while Carnac feels that her work is all about the accidental, chance marks –“mistakes” – and not quite knowing what will come out of the kiln; Rowledge described a more problematic relationship with “mistakes”. On the one hand, mistakes in the construction of a book binding are a “no”, because they undermine its integrity. But on the other, she talked about looking for the unknown, the unexpected, because if the work is always “perfect” and predictable, there is something uninteresting about that and, what is more, your work never moves on. In my own case, I love the accidental, unexpected marks and finding ways to approach the work so that I have less control and there is room for these accidental, unintended consequences is inherently more interesting to me. That's not the same as being “sloppy” – it’s important that the work is well finished. It’s a balance between practicing the knowledge and skill built up over years of experiment and practice and leaving room for the materials and process themselves to affect the outcome in ways I can’t completely control nor predict. That period immediately after finishing a group of work is tricky. Having worked so hard, I knew that I would need a break. So I haven’t worried too much about what I’ve been doing in the past couple of weeks. Which is not very much! But I’m starting to prepare to get back to work. Part of that is reviewing what I have just done. Looking at the group as a whole, I’m noticing different aspects that I want to develop – composition, marks, layering. And within the group, the work falls into one of three variations. I decided not to give pieces individual titles this time so they are named for each of these sub groups. The main group, Between the Lines, was the most “planned”. This includes the larger pieces, including two of the largest pieces I have yet made. These use some of the ideas I explored in my drawings and are inspired by horizons and places where water meets land. A second group, Transience, is closely related but evolved more freely once I started working with the actual marks on the cloth I had made. To me these are more specifically about things that are in the process of moving, flowing and changing. 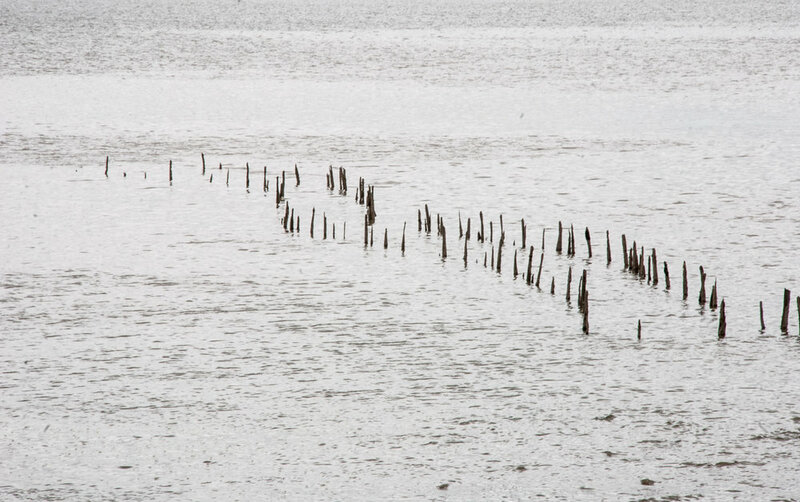 Both are about liminal, ambiguous places – tidelines, creeks, estuaries – where things are in constant flux and neither completely solid nor completely liquid. But they are also reflections on another sense of “liminality” – the psychological space between not knowing and knowing. Such as when someone is in the midst of learning something but has not yet properly understood it. It’s the parallels between the two that fascinate me and I shall continue to reflect upon and explore this. One of the things I enjoyed about this series was the way that the monoprinting process resembled these processes. Each print was the same but some details were lost and new ones emerged from one to the next. Between the Lines 2 in particular exploits this transition, being built around three consecutive prints. You can look at it as a continuous “horizon” or as three separate snapshots of the same space. The third group, Blackthorn, is more distinct and grew out of my print experiments last summer. It uses completely different imagery developed from photographs I took on an icy, foggy February morning several winters ago. At first I felt these were unrelated, but when I consider them, their attraction to me is also related to their diffuse edges – neither solid nor empty space. The process of photographing all these, particularly the close-ups, also helped me to see them differently and suggested new ideas. I particularly liked the more extreme abstraction of some of the cropped images. I’m starting to make plans for the next phase of this series. … which means it’s time to get back into the studio. In the meantime though I have a short break in Norfolk to look forward to. A large proportion of this work will be in the exhibition at Bircham Gallery which opens this Saturday and runs until 6 March. All the work can be viewed on their web site. In early December I planned out all the work I needed to do. An exhibition in February means work has to be ready for framing … around now actually. It was all perfectly possible on paper. But it’s one thing to block out time on a plan and write “stitch work”, for example, and quite another to actually do it. In the studio I surveyed the pile of work I needed to finish and felt slightly terrified. A deadline is a wonderful thing for getting focused. I dropped or deferred everything that did not contribute to getting the work done (including this blog) and settled down to work. Apart from a couple of days with my family, I stitched all the way through Christmas. It goes something like this. I pull out each piece of work and lay it on my studio table. In this case I had already stitched them all to a backing fabric. Canvas this time (I had my reasons but never again – my poor fingers). I lay out different threads on top of the work until I have a palette I want to work with. Silk, rayon, cotton – some matte, some shiny. Mostly very fine in weight. I look at the piece of work for a clue as to what to do and where to start. Mostly I work with the marks on the cloth, sometimes I work against them or look to add marks where there are none. I will have an idea what I want but not usually a plan for the whole piece when I start. I will know where I want the emphasis to be but otherwise I will ask myself as I am working what the piece needs. Occasionally there is a piece where I don’t know what to do. When there is a type of mark I haven’t worked with before. Or the marks in the cloth are so subtle that I am really not sure what to add – or whether to add anything at all. In this case I just try something. If it doesn’t work, I pull out the stitches and try something else. Change thread. Larger stitches. Smaller ones. A different kind of mark. Dense layers of marks – or sparse and widely spaced. I take photographs – sometimes it’s clearer what you need to do when you look at an image of it. For two weeks I worked like this for six to ten hours a day. I listened to music or radio documentaries. Sometimes I worked in silence. If this sounds relaxing, I can’t say that it was. There was a tension between the slow, patient hand work and the underlying sense of pressure to get everything done. This was a consequence of working to a tight schedule, not the experience of slow stitch. And there wasn’t time to play around or experiment too much. As I worked, ideas came to me – things I want to try. Not just stitch ideas. I jotted them down in my sketchbook so as not to lose them and kept working. I was mildly frustrated that I couldn’t afford the time to stop and do other things. Which made me ponder the value of both work and play. I remembered how earlier in the year I was frustrated that I didn't know what to do and was not “working” and used play and experimentation to keep myself going. The work I am doing now derived from that period. Anyway I am now preparing a pile of finished work for the framer. I have some admin things to do but otherwise I will soon be through this phase of work. Then I am going to do something else for a while. I will be showing some of this new work in an exhibition alongside paintings by Stephanie Stow and Elaine Cox at Bircham Gallery in Holt, Norfolk from Saturday 13 February until 9 March. I also currently have some work in a mixed show at The Bank in Eye, Suffolk. The exhibition, Abstraction of Form, runs from Tuesday 19 January until 28 February. A day off from studio work yesterday to deliver work to Bircham Gallery for their Christmas Exhibition. If you are in Norfolk, the exhibition runs from 5 December until 13 January and you can see my work alongside that of several other gallery artists. The above image is of a piece called Transient, which is a favourite of mine. Of course we could not go all that way without heading out for a walk across the marshes. After some brief sunshine first thing in the morning it was grey and cold with a wind from the north-west, that grew stronger and wetter as the afternoon wore on. We started from Morston and headed west across the marsh along the southern edge of the Blakeney Channel. It was low tide and I love seeing the channel exposed with most of the water drained out of it. There was fresh seaweed and other debris strewn along the edge to remind us that the ground we walked on could be underwater again in a few hours. But in the meantime there is this bleakly beautiful landscape spread out between the edge of the marsh and Blakeney Point in the distance. Brent geese, curlews, redshanks, gulls pick their way over the surface looking for food. The surface changes between mud, shingle, sand creating changes in colour and texture across the surface. And the creeks reflect the light, silver grey, twisting their way towards the channel. I raced back from North Norfolk yesterday to set up the exhibition with Clive Barnett at Art Van Go in Knebworth, Hertfordshire. I am delighted to be showing some new work alongside Clive, who shares my interest in mark-making. The exhibition runs from 2 to 19 September. Secondly, I was honoured when Maggie Grey asked me to write an article for Workshop on the Web about my daily mark-making practice. This has now been published in September's edition (subscription needed). I travelled to Cologne for the day on Friday to see an exhibition of Boro textiles. This was the same exhibition that was first shown at the Domaine de Boisbuchet in 2013. First, a word about the photos. The museum allowed photographs provided I did not use flash. Since the textiles were displayed in low light this compromised quality. These images are the clearest I could manage ... with some significant editing to improve sharpness and clarity. Sometimes this is at the expense of colour accuracy. The museum made a link to kesa, robes pieced together by Buddhist monks from cloth they received as alms, originally rags. Ironically, since rich Buddhist followers would often donate precious textiles to show their devotion, kesa were sometimes made from rather splendid, embroidered silks. The exhibition included some gorgeous examples from the museum's own collection. Japanese peasants originally wore cloth made from local bast fibres - hemp, ramie, mulberry, wisteria, nettle. The softer and warmer cotton became popular in the eighteenth century ... but was only available to the rich. Rural people bought used, damaged cotton clothing from itinerant rag merchants or traders and mended or re-used the cloth. Sashiko is the term for the running stitch used either to mend cloth or to piece small pieces together into a larger cloth. Originally bast fibre was used. It was only once people gained access to softer, more pliable cotton threads (from the mid 19th century), that the decorative designs and patterns developed that we associate with the term sashiko. Since I knew I was not going to get good photographs, I made lots of notes and rough drawings of the aspects that interested me. I was particularly interested in the variety of approaches to the stitching. There was no single approach, different examples showing the individual style and skill of the maker(s). Some pieces were so densely stitched that they looked woven, especially where the stitching was close and even. But then later repairs disrupted the original stitch pattern, creating interesting discrepancies. Another example was the complete opposite: the stitching was sparse - tiny stitches, widely spaced, creating a totally different rhythm. In many places stitches had worn away, leaving gaps in the stitch line or loose threads. Heavily patched areas created overlapping stitch lines that didn't always relate to the visible patch, revealing something about what was happening in the layers beneath it instead. This aspect really appeals to me. Sri Threads - examples, with information, of boro textiles. Stephen Szczepanek co-curated this exhibition and provided many of the textiles from his private collection. I am delighted to be showing some new work in Bircham Gallery's Early Summer Exhibition. This is a mixed show which also features paintings by Anne Davies, Keith Roper, Tony Foster, Mhairi McGregor, Martin Laurance, Stephanie Stow and Sally Tyrie; and ceramics by Virginia Graham and Lowri Davies. The exhibition runs from 23 May to 17 June. There is an online catalogue with details of all the artists and their work. You can see my page here. I am also preparing for an exhibition from 2-19 September at Art Van Go in Knebworth, Hertfordshire. This will be a joint exhibition with Clive Barnett. Further details to follow. Finally, I am very honoured that John Hopper of The Textile Blog chose to write about my work in Issue 4 of Inspirational magazine. I made a flying visit to Grimsby at the end of this week to see the 62 Group's latest exhibition. A 400 mile round trip from one end of the North Sea coast to the other. This was in fact rather appropriate as a significant number of Grimsby fishermen apparently migrated there from the Thames Estuary in the late nineteenth century, when the town was developing as a fishing port. "Ebb & Flow" is a response to Grimsby's history as a major fishing port and to the excellent museum collection at the Fishing Heritage Centre in particular. The exhibition is divided between the latter and Grimsby Minster. It was interesting to see how different artists responded to the theme. Some made direct reference to the fishing industry or the port while others made more indirect reference to the theme of tides, flow or change. The work of five artists caught my attention in particular. The first was Hannah Lamb. Her piece Baptism explored the experience of cold water swimming. 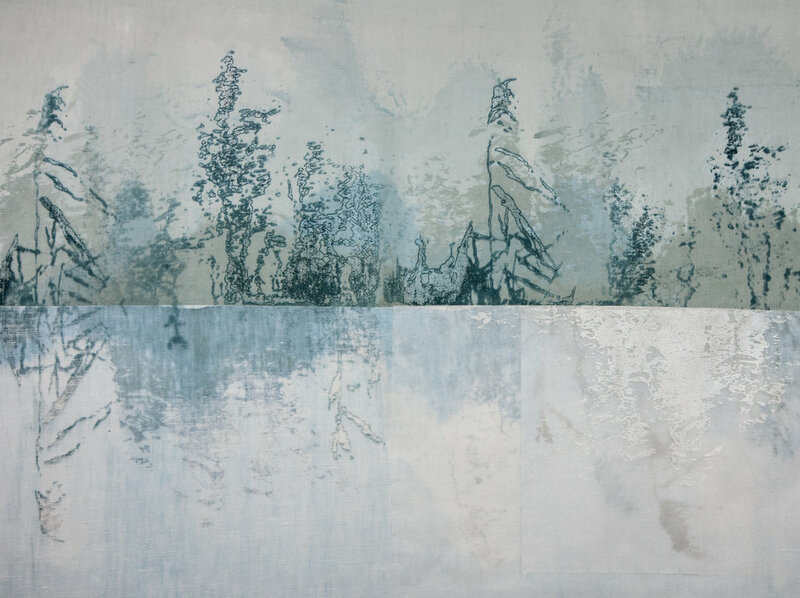 It consisted of a triptych of organza panels printed using the cyanotype process. The imagery, on separate panels, showed the head, hands and feet of a woman and succeeded in conveying the idea of someone in water. But what I loved was the way Hannah also conveyed the sensual aspect of being in water. With the most minimal, delicate stitching she suggested the touch of water against a finger or a swirl of water across the toes. For me this lifted the work from being a simple image on cloth to something altogether more tactile and sensual. Hannah's blogpost about this piece is here. Sue Stone is based in Grimsby and her pieces - two in the museum, one in the Minster - told a story about people in the town. The colour palette and format remind me of the colours of old photographs. Here too though the detail of the stitching and appliqué add to the image, so that when you look, there is far more information than in the picture alone. In Portrait of a Grimsby Girl the bricks are covered with stitched writing telling you details about the woman's life. In The Unknown Statistic, which is about the children left behind by fathers who went to war and never came back, the man is not in the picture but, across the wall is a fluid line of embroidery tracing the sense of the tune he whistles as he walks away. Close up, I was fascinated too by the stitched patterns used so effectively to show the textures of the figures' clothing. Sue Stone: "The Unknown Statistic"
Jane McKeating's piece consisted of five large panels titled "Red - a sampler". At first I thought these were painted but they are digitally printed from Jane's own drawings. Inspired by samplers, paintings and symbols in the museum, the panels trace the "ebb and flow of a red mark through the passage of time." Each panel shows a sewing machine - a progressively more modern one - stitching a length of bright yellow cloth. Apart from some white stitching, which adds texture to some of the panels, the only stitching is the red "stitched" line. As the sewing machines evolve, so does the mark, from a basic straight stitch in the first panel to a more complex computerised design in the fifth. What struck me, however, was the juxtaposition of the domestic sewing machines with the "high vis" yellow cloth, suggesting protective or waterproof clothing. So many thoughts here about the connection between the lives of fishermen on the sea and their wives, mothers, sisters at home. Jane McKeating: "Red - a sampler"
In a completely different vein, I loved the work by Ann Goddard. Discarded consisted of five bundles of driftwood, twigs and rusted metal "tangled" together by shreds of vintage fishing net and wire. There is a reference to "ghost nets" - lost nets which continue to trap debris, fish and other organisms. To me each bundle was like a three dimensional drawing. There was a larger, related work in the Minster, constructed of willow and wire which had a similar effect. Finally, I loved the ikat weaving of Christine Gornowicz, particularly the way the receding verticals emphasise the sense of movement in the horizontal flow patterns in the one below. I recommend a visit to her web site to see more of her beautiful work. At this year's Festival of Quilts in Birmingham is an exhibition of work by American quilt artist, Ann Johnston. Until now, I've known her work only through her books. Her two books on dyeing are some of the best on the subject as far as I'm concerned. They manage to be comprehensive (in terms of the range of dye techniques they cover), totally sound on the technical aspects and yet easy to use. I've had my copies for years and still refer back to them. The exhibition presents 16 quilts. As the accompanying book explains, "The word "contact" refers to a place where geologic units touch each other." Many of the quilts represent geological features - veins, intrusions, geological processes - close up or impressionistic images of the rocks themselves or abstract interpretations of the processes that lead to their formation. Other quilts present images of the mountains of the Sierra Nevada themselves. Because "..."contact" also conjures up a human influence on the landscape. The forests, the rivers, and even the mountains themselves have been shaped forever by people seeking their fortunes." For this was gold mining country and many of the quilts refer to this. One of the impressive things about this body of work is the stylistic variety between the different pieces, while they remain totally cohesive as a group. Bold pieces built of simple forms in strong, plain colours hang alongside more complex, designs built up of highly detailed visual textures. Abstract images alongside highly realistic pieces. It worked because there were clear relationships between the pieces. All the quilts are made from cloth that Ann Johnston has dyed, painted or printed using a wide range of surface design techniques. Inevitably, I was drawn to studying the detail of these. I was particularly fascinated with her use of monoprinting and resists - and Ann was very generous in explaining how she had achieved some effects. I also noted how she worked back into the painted cloth, using appliqué and stitch to alter and augment the dyed marks. But over and above these technical aspects, I really admired the mastery with which Ann had orchestrated the different patterns and textures in her fabrics to produce the effects she wanted. Above (clockwise from top left): details from "Cracked and Cooked"; "Black and White"; "Vigil" and "After the Ice". All work by Ann Johnston. 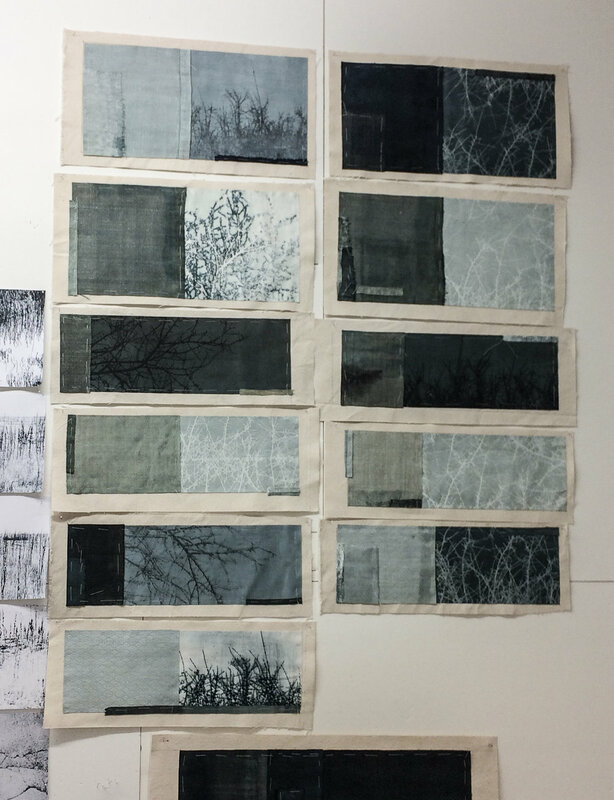 I was also able to hear Ann's lecture "The Stitches Matter" in which she talked about the way she uses stitch to add layers of marks, line and detail to her dyed cloth. I had already noted that her approach to stitching each piece was quite varied from one to the next but always well considered in terms of the effect she wanted to achieve. For more information, go to Ann Johnston's web site, where you can order copies of the exhibition catalogue along with her other books. Ann has also produced a DVD, Color by Accident, which expands upon her book of that name and is well worth having. I drove 150 miles to Gloucestershire in the rain on Friday to see what I could of the SITSelect exhibitions. My sat nav guided me up the steepest, narrowest lane with heart-stoppingly beautiful views (when I dared to look) to Newark Park. I read the advice to not use your sat nav only after that little adventure, once I was safely in the car park, checking the visitor information. Newark Park showed work by 30 artists that was distributed throughout the house. It was lovely to see work displayed in a domestic rather than a gallery setting. Seven of the artists had created work that responded specifically to the house or its surroundings. Others had been selected by SIT patrons; others were artists involved in the Select Trail. Sometimes the juxtaposition of such different styles of work made for an uneasy combination and it wasn't always obvious when you were looking at site-responsive versus selected pieces. And sometimes you weren't sure whether work was part of the exhibition or part of the house... although this rather added to the enjoyment of exploring the house. Three artists particularly caught my attention: Caroline Bartlett, Jane Ponsford and Jo Lovelock. Caroline Bartlett's piece "A stitch in the fragment of time" played with ideas about the fabric of the building. Porcelain discs that had been impressed with cloth and lace textures were inset into thick felt and displayed in a long glass case. Fragments of lace, stitches, fur and feathers were trapped in many of the discs. I liked the sense of something fragile being preserved - and the tension of fragments that appear to have a story behind them but, being removed from their original context, you can only guess at what that might be. Jane Ponsford's "A landscape in ten parts" was a grouping of ten bell jars containing hand made paper forms that reminded me of nests, trees, reeds and other landscape elements. The paper was stained and marked with clay and other traces from the landscape. I liked the simplicity of the individual pieces but the way these worked as a group, overlapping and responding to each other, was really engaging. Jane Ponsford's website has more details about the thinking and process behind this piece. Jo Lovelock's "Amiticia" was inspired by the previous owner's enormous collection of damaged china swans and used copies of letters and papers to produce a paper swan and accompanying quilt-like piece. The use of letters gave a sense of the people connected with the house and the network of friendships. I liked the visual impact of the variety of handwritten marks and the shadows made by the folds. See more about this on Jo Lovelock's blog. The next morning (Saturday), I went to see Alice Fox's solo exhibition at Lansdown Hall. I was grateful that Alice took pity on me and let me in early out of the pouring rain. I've seen Alice's work before but this was a much broader cross-section of her work. Alice's use of found objects to make marks on cloth or paper creates a direct relationship between the marks and the place these objects come from (usually, but not always, the coast). The palette is restricted - natural cloth, rust, tea, and printing ink, which keeps the focus on the marks. 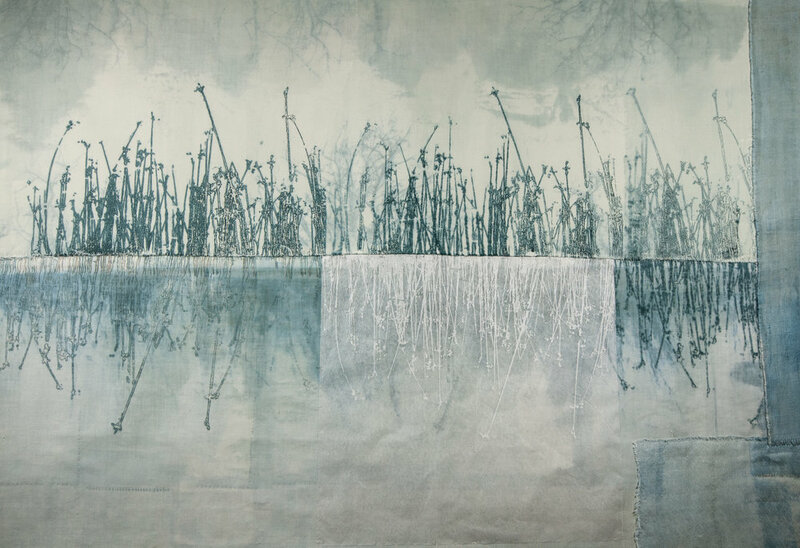 She adds collagraph, other printmaking and hand stitch in response to the organic marks generated by the objects. Sometimes this turns the marks into something that reminds me of a map, or the marks in the sand left by the tide. I particularly love Alice's concertina books and the way their long, thin format somehow captures the sense of a journey or a walk. In this exhibition, there were also some larger format works on paper, which were incredibly subtle and reminded me of the marks the water makes in wet sand on the beach. There is a review of this exhibition (different venue) here. My final visit was to the exhibition Shadow and Line at the Museum in Stroud. This brought together nine artists working in textiles, turned wood, enamel, porcelain and mixed media. This was a strong exhibition and it was wonderful how work by the different artists worked so well together, echoing themes and aesthetic qualities. Shadow and Line - Caroline Bartlett on the left wall; Elizabeth Turrell and Linda Brassington on the right. 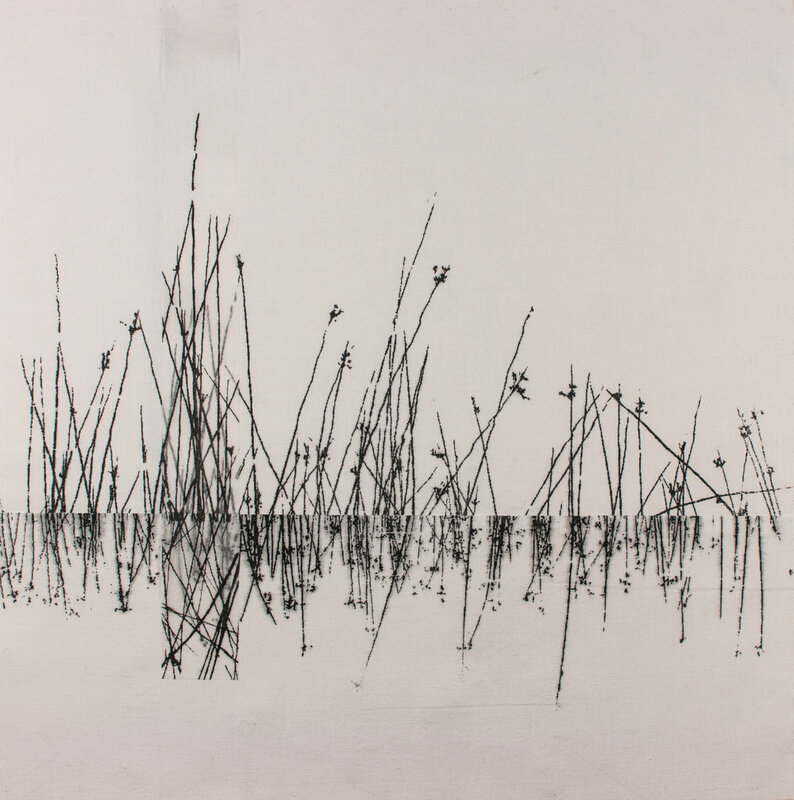 There was more work by Caroline Bartlett - "Backwards, Forwards" - in which she has gone back to her older work, which used pleating and folding, and through scanning and redrawing has used this to create new pieces, like stitched drawings of the originals. The results look like geological or archaeological diagrams. I was absorbed for ages in studying the range of different hand stitched marks. Of the remaining artists, three interested me in particular: Hilary Bower, Jilly Morris and Linda Brassington. I was particularly intrigued by the way they all manipulated, marked and altered the surfaces of the materials they used. Hilary Bower used humble materials (sandpaper, masking tape, greaseproof paper ...) into which she rubbed graphite, pastels and paint to create dark, shadowy, cloth-like surfaces. Behind glass, they were a real challenge to photograph. There were two wonderful pieces by Jilly Morris where she had hand-drilled thousands of holes into inked and waxed paper to change the surface. But I was fascinated by another piece where she had explored the range of marks she could make with a printing roller. Close up, individual marks looked like extracts from a landscape drawing, but twenty strips of these linear marks combined into one piece had a huge impact. Finally I admired the way Linda Brassington combined resist dye, discharge with powdered pigments and wax to create surfaces with such depth of colour and texture. There was a real sense of light being drawn into and absorbed by these dark surfaces. Some of the pieces are shown on Linda's Axisweb page. Photos (in order): Caroline Bartlett, Hilary Bower, Jilly Morris, Linda Brassington. I drove home again in dreadful weather and took most of Sunday off to recoup energy. I've seen so much and am still absorbing impressions and ideas, although thoughts about different surfaces, textures and mark-making (as ever) are uppermost. For information about this and future events, see the SIT web site. You can also view this year's brochure online. My visits to London are infrequent so I like to make the most of them. Hence I've had a long day criss-crossing the city from East to West and back again to catch three exhibitions. I'm tired, my feet ache and my head is buzzing but I want to take the time to collect my thoughts. First, I went to Clerkenwell to see Gizella K Warburton's solo exhibition (finishes on Sunday). Visit her web site to see very good images and more information about her work. I last saw Gizella's work at Alexandra Palace in 2010 so was intrigued to see how it has developed. I noticed more three dimensional work and integration of wood and slate alongside the cloth and thread. The common ground is that we are both interested in marks - as she puts it, "the innate human urge to make marks ... to decipher the meaning of our physical and emotional landscapes, and the transient nature of the warp and weft of our lives." One of the striking features of Gizella's work is the way she never disguises the true nature of her materials. Everything, cloth, thread, wood, remains exactly what it is even as she combines and juxtaposes colours and textures. The colours are monochromatic - mostly the natural colours of her materials. Texture is emphasised - creased cloth, scorched wood, frayed edges. Even where she coats the cloth with paint or medium, whether printed or painted, the original texture tends to be emphasised rather than covered. What fascinated me most though was the breadth of stitch vocabulary she achieves within only one or two stitch types. Her stitched marks are as important as the cloth. They are nearly all variations on knots or straight stitches, plus couching of thread directly onto the surface. But she finds so many variations within this repertoire. Thread ends are often exposed - adding to the texture. I admire the way she varies the rhythm, density and placing of the stitches with such good judgement as to what each piece needs. Perhaps I was particularly tuned into noticing this since I am in stitch mode in the studio at present. I was also attracted to a number of pieces that took curving and overlapping forms. These were often in ceramic, glass or metal and the curves resembled the soft folds of cloth - and yet, if you did this in cloth, it would be hard to pull off the same effect without stiffening or supporting it in some way (unless the cloth is naturally quite stiff). Still, something else to reflect on. 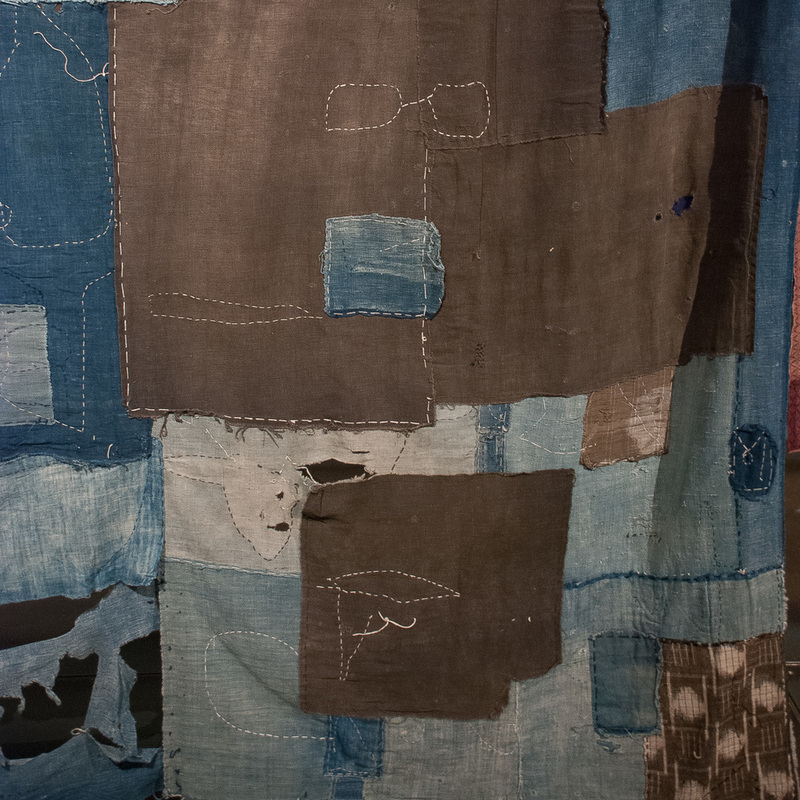 Yesterday I went to see an exhibition of Boro textiles at Somerset House in London. Before I even got there, I was aware that there was a debate about the way the textiles were displayed. The exhibitor has made a deliberate decision to display the textiles stretched over boards and hung on the wall. Some feel that this is totally inappropriate. These were domestic textiles - clothing, futon covers, wrapping cloths - that are the product of a tradition of continuously patching and repairing cloth for utilitarian and economic purposes. Boro means something like "ragged" in Japanese. Displaying them in this way removes them from that context. It also imposes limitations - you can't view both sides, you lose the edges and the clues as to their original use. From being domestic artefacts with a life and a history, they become two dimensional art objects, to be appreciated for their visual qualities. However, the visual impact of the textiles on the bright, white walls of the gallery was stunning. Misgivings evaporated as I walked into the first room. These are fascinating textiles and seeing them this way allows you to fully appreciate colour and composition. If it had been a museum show, you would expect more emphasis on the cultural context in which the cloths were made. But this is a selling exhibition and the exhibitor is consciously positioning them as fine art objects, priced accordingly. It's an interesting tension. The catalogue poses the question "Can art transcend function?" I don't believe that the people who originally made these cloths did so with a deliberate aesthetic intention. They were made to be used. Pieces of cloth were joined together to make a larger cloth. Holes and tears were covered with patches. The stitching is functional - just enough to hold the pieces together. But at the same time, the culture within which these cloths were made featured a strong craft tradition and a very considered approach to the most everyday activities and this comes through even in these so-called "rags". On a striped patch, the stitcher has followed the lines in the cloth. On another, it does look as though the maker made deliberate decisions about the colours and positioning of the patches. It does appear that some makers were paying attention to the visual effect of what they did. But it is unlikely they were ever made to be viewed as "art". I think it says as much about us and our own cultural context that we do. 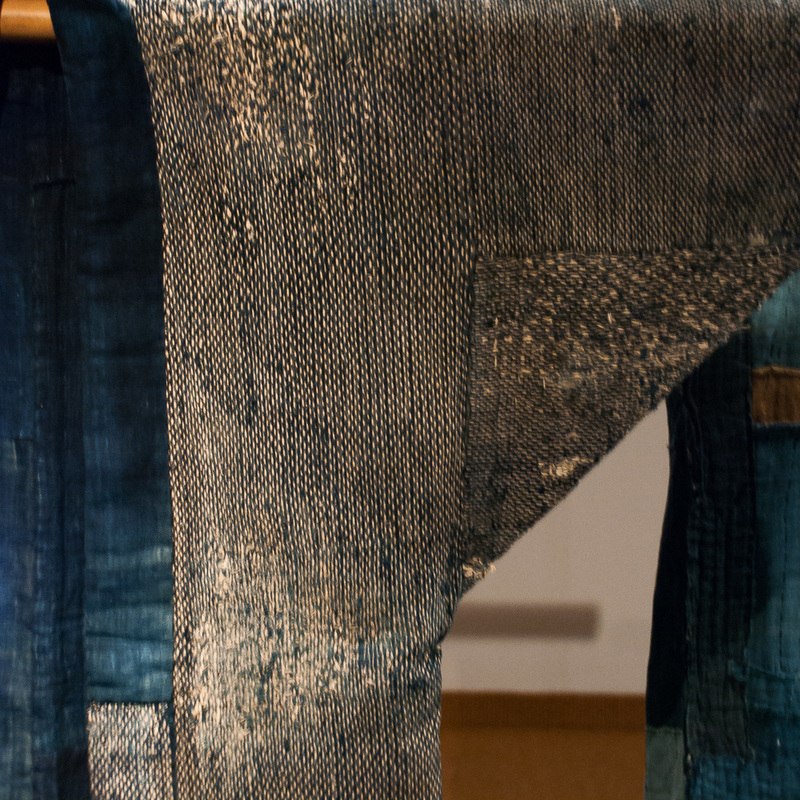 We look at Boro textiles, with eyes that have become accustomed to modern, abstract art. We recognise some of the same qualities and accept their presence in a gallery setting. At the moment though this is apparently a predominantly Western thing. While I was there I overheard part of a conversation between one of the attendants and a Japanese visitor who was bemused to find these textiles presented like this, in a gallery. 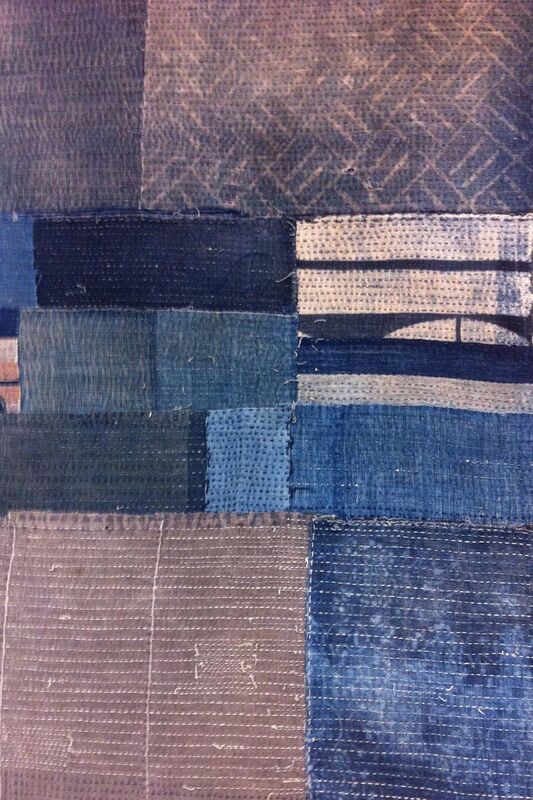 In Japan, Boro textiles are not valued in the way they are by Western collectors. Leaving aside this debate, I spent nearly three hours looking closely at the textiles themselves. I couldn't face carrying my camera around London yesterday so these images are the best I could manage with my iPhone. What caught my attention was the layering of the patches - the way holes overlapped and revealed layers beneath - and the stitching. Most of the stitching was quite rough - some neater than others but it was the kind of stitching you make when you tack things together. There were traces of the individual makers in the size and rhythm of the stitches. I noticed the stitching usually followed a "route" - e.g. the maker would usually stitch around the sides of the patch and then into the centre in a continuous line. This meant the stitch line became a kind of path. Secondly, the stitching of the patches on one side of the cloth showed through on the other - so while the function of the stitching on the side you were looking at was obvious, there was this additional layer of stitching that hinted at what was happening on the other side. Often, bits of the stitching were missing so you had to interpret what was going on with incomplete information. I find this quite exciting. Also, the layering and stitching of some pieces made me think of a map - but a map that was showing multiple layers at the same time. Lots to think about here. The exhibition is on until 26 April and there is a well illustrated catalogue to go with it. Details here. 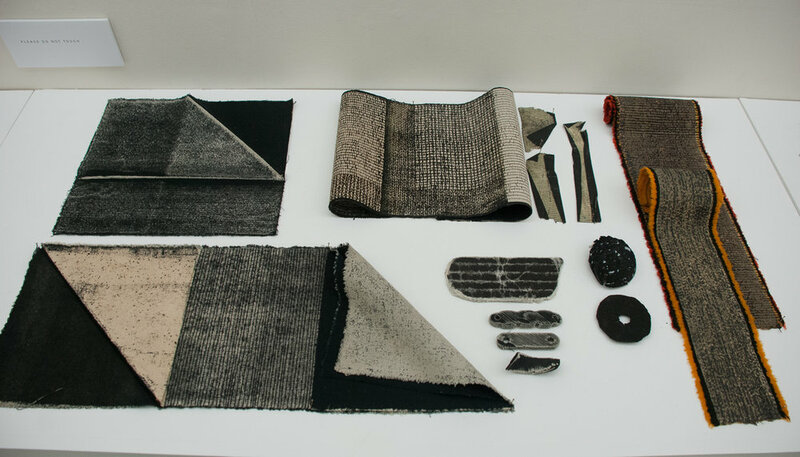 Also, see this article for a very different approach to exhibiting Boro textiles.